One issue that seems to plague a lot of relationships is cheating partners and how to handle them. 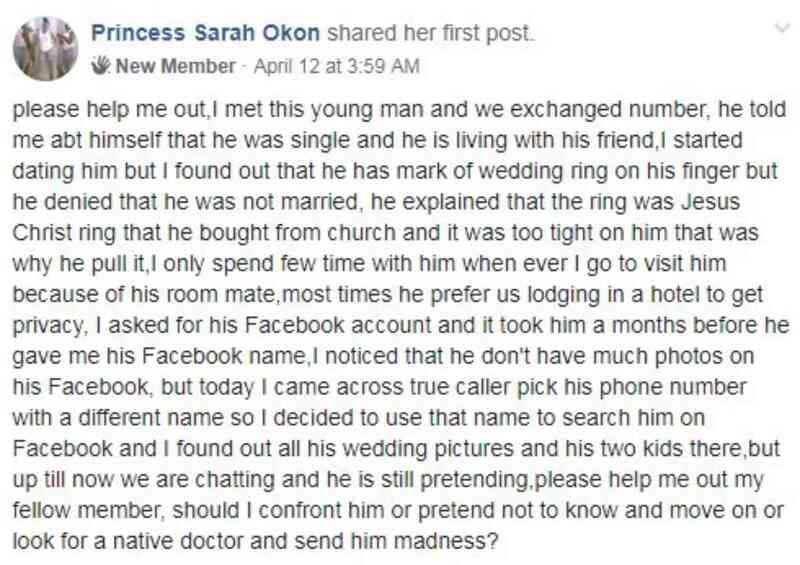 A young Nigerian lady identified as Princess Sarah Okon on Facebook revealed how she discovered her boyfriend was being unfaithful. Okon explained that she met a young man who claimed to be single and living with his friend. She added that they started dating after a while. However, she began to feel suspicious after she noticed a ring mark on her bae’s hand. The bae was quick to explain that a Jesus ring he bought from church left the mark because it was too tight. Okon seemed not to have been satisfied and she revealed that she asked for his Facebook username which he was reluctant to give. When he eventually did, not much was on the page. The young lady further explained that she came across another name on his True Caller identification and she decided to look up the name on Facebook. That was when Okon discovered that her bae was actually a married man with two children. She added that they still communicate because he is unaware of her discovery. Okon also asked for suggestions on how to handle the matter. She wrote: "Should I confront him or pretend not to know and move on or look for a native doctor and send him madness?". Every lady loves to be looked at as the only pretty woman in the world especially when it is the man after their own heart that does the looking. However, some men face dire consequences for not complimenting their partners.